Can Anti-Evolution GOP Evolve on Immigration in California? He was talking about the party's nationwide Paleolithic attitude about immigration that could doom GOP electoral chances in California. On Saturday, the Sacramento Bee spotted the party’s attitude softening and on Sunday the transformation was clearly evident when the delegates approved a mushier plank in the platform. The document still aims to make English the official language of government, according to Breitbart. But it dropped the explanation contained in the old California Republican platform (pdf) of what English-only means in real terms. That document, which represented the principles and aspirations of the party the past four years, said all election ballots and other government documents should only be printed in English. The old platform said new immigrants should be required to learn English and businesses should still be allowed to require employees to speak only English while at work. 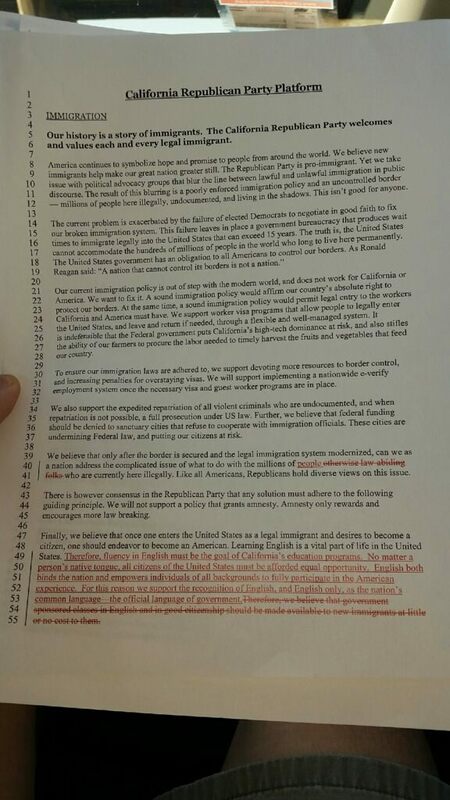 Republicans also took out the part calling for deportation that said, “Allowing illegal immigrants to remain in California undermines respect for the law.” Apparently gone from the document is a call for an end to all federal and state benefits to undocumented immigrants other than emergency medical care. Undocumented immigrants are no longer called illegal aliens. The platform won’t continue to push for compelling workers on guest visas to carry tamper-proof identification cards with biometrics to allow the government to track them. And talk of cross-deputizing state and county law enforcement to help deport those who have committed crimes has been stricken from the plank. “We took a common sense approach,” Marcelino Valdez, the Central Valley regional vice chairman who worked on the immigration plank, told the Orange County Register. The plank was opposed by the party’s more conservative members but was overwhelmingly approved on the convention floor. The old language of the platform appeared to be fine as long as no one looked hard at it. And in California, where Republicans don’t hold a single statewide office and are dominated in the Legislature by Democrats, it was easy to ignore. But, the wildly popular presidential candidacy of Republican billionaire Donald Trump, kick-started with anti-immigrant rants, has made the state platform a marketing challenge. There is a problem with the brand, and California Republicans want to change that while offering little in the way of actual policy shifts. They were hurt, if not angered, by the decision of presidential candidate Governor Scott Walker (R-Wisconsin) to back out as convention keynote speaker at the last minute. Although Walker didn’t start the campaign this way, he pretty much agrees with Trump’s immigration policies, including construction of an impenetrable wall between the U.S. and Mexico. Walker also supported repeal of the 14th Amendment guarantee of birthright citizenship, but quickly waffled over to a public no-position position. There is no indication that California Republicans, once elected to office, would buck the party’s national trend of harsher immigration policy advocated by all 17 of the GOP candidates for president. But the new platform almost certainly gives them an opportunity to talk nicer. “I think it sets a more positive tone; a more welcoming tone,” Ruben Barrales, the head of a GOP Latino outreach group called Grow Elect, told the Sacramento Bee. But the practical effects, according to Tea Party caucus member Randall Jordan, were likely to be minimal despite the evolution.